Lounge and socialize with a room full of 30+ adoptable cats. Your visit directly supports our mission to reduce euthanization by increasing adoptions while socializing cats. Admission is considered a donation to CatCafe Lounge and is tax-deductible to you. CHEERS! RESERVATIONS HIGHLY RECOMMENDED AS WE LIMIT THE SPACE TO 15 PEOPLE FOR THE SAFETY OF THE KITTIES. CatCafe Lounge is also perfect for private events including birthday parties, team building, and group meetings. For more information about a magical event at our cat cafe, click here. Every admission comes with complimentary coffee or tea. We also have specialty items for purchase, such as, Kombucha & Cold Brew Coffee on draft, Iced Chai Lattes, and sweet/salty snacks. *WE HAVE A HUGE PARKING LOT! NO STRESS, MORE CATS! *TO RESERVE MULTIPLE GUESTS, CLICK ON EVENT, "QUANTITY" BOX IS LOCATED TO THE RIGHT. *Age limit is 5+. 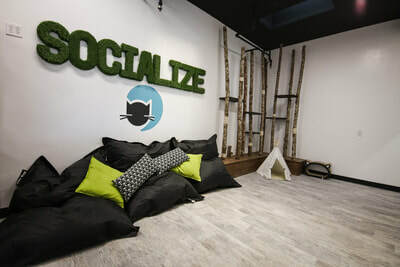 Because CatCafe Lounge is working to socialize and rehabilitate stray cats, we ask all visitors to help us create a calm and quiet environment for the cats. Anyone can be asked to leave (without reimbursement) if they are being disruptive or harmful to the residents. *No minors under the age of 12 can be left unattended in the lounge. *Due to demand we cannot allow cancellations less than 24hrs prior to reservation time. *The building does not have an elevator and we are located on the 2nd floor. Please email us so we can assist with accommodating you. Access to our upstairs Catopia is via the metal gate in the center of the building (facing Sepulveda).